The types and varieties of horns are numerous, but they fall into two basic categories - wood or metal. Once you decide between these two, you need to decide height, cap size, pitch, and shape. We wrote this page to help you better understand how these things work together so you get the look you want in your tree. We put a few pictures on this page to illustrate the concepts, but please see our pages on Wood Post Horns and our Metal Horns page for a full range of pictures. The first and most basic choice is between a metal horn and a wood horn. Either are strong enough to rope from (our Construction Materials page gives an explanation of how we make the forks) so what are the advantages of one over the other? Depends what you want the saddle to do. 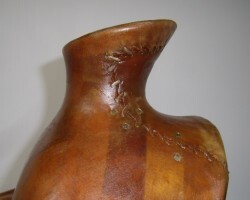 The wider diameter of the horn neck has comparatively more surface area than the small neck of a metal horn giving more friction with every dally so you do not need the same number of dallies if you use a mulehide wrap on your horn. Since they are constructed as part of the fork, they can be shaped to a saddle maker’s specifications. They can also be positioned farther forward or back on the fork if you want something specific. The minimum horn cap size we offer is 3 ¼” (as explained later) so they are a bit large for a good hand hold if people want to use them as such. They are relatively big, so if you don’t like the look of a big horn, you don’t want a wood post horn. Anything over 3 ½” tall looks pretty massive with a wooden horn while it is still OK with a metal horn. We use a minimum stock thickness on the fork of 4 ¼” (unless you request differently) to balance the look of the larger horn. They are smaller so they are easier to grab and hold onto, either around the neck if they are tall enough or over the cap if it isn’t too large. Cutters, barrel racers, trick riders and trees for inexperienced riders all benefit from the smaller size. Taller horns still look OK.
Cap size can vary from really small to as large as you think looks OK. They are farther off the horse than wood post horns because you need a gullet thick enough for the length of screws needed to attach the horn, thus leverage on the horse is greater when roping. A narrow neck needs more dallies to hold with a mulehide wrap. You can’t get specific shapes unless the horn maker casts them. What is available from the horn makers is the range of variations available. 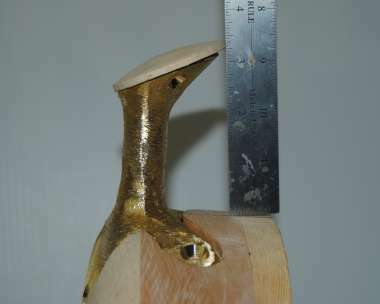 The length of the neck of the horn combined with horn cap size determines the final horn height measurement, so small changes in height can’t be made unless the horn maker makes a new mold for that height. The minimum cap size we offer for a wood post horn is 3 1/4" in the rawhide. Why? Because this means that the cap in the wood is only 3”, just ¾” larger than the 2 ¼” neck size. This gives the minimum definition we think necessary between neck and cap for good horn cap construction and for holding dallies when roping. The largest cap we have built to date is 5 ½” in the rawhide. With the larger horns, the neck size is left larger to make it easier to turn loose your dallies and to balance the look of the cap. With larger caps, you should consider increasing the stock thickness so the horn doesn’t stick out past the lip. We shape the dome appropriately for the size of cap unless you request a completely flat cap. We set the pitch of a wood post horn against the back of the fork before any shaping is done. While the angle cannot be measured on a finished fork due to the rounding on the fork and the horn, we label the pitches by the actual degrees so we can communicate specifically with you. The pitch affects the look of the horn, not only in how much the cap tilts upwards but because it affects the height of the back of the horn relative to the front. Lower pitches have more height at the back, making the horn appear taller overall than the same height of horn with more pitch to it. We have three common pitches – 24, 27 and 30 degrees. 24 degrees still has a slight amount of pitch when on a horse, 27 degrees has more and 30 degrees has still more. We have done a few trees at a flatter angle but you don’t want to get too flat or the horn may run downhill when on a horse. We have also added extra pitch for an old Mex look. There are pictures of these at the bottom of our Horns on Wade Trees page. We can help you determine a good horn height for these ones so it doesn’t get too short at the back. The angle of the lip of the fork (top cut angle) is different between a Wade and a swell fork, with the swell fork lip dropping faster than a Wade lip. This makes the horn appear to have more pitch on a swell fork than a Wade, even if the measurements are the same. We don’t generally recommend a 30 degree pitch on wood post swell forks because they just look so angled. The difference in top cut angle also makes the back of the horn shorter relative to the front of the horn on a swell fork compared to a Wade and this may need to be considered with shorter horns. Since the pitch is measured against the fork and not the whole tree, when you stand up a fork, the pitch increases relative to the tree. A 5 degree lower pitch on a stood up fork matches that on a leaned ahead fork on our trees. 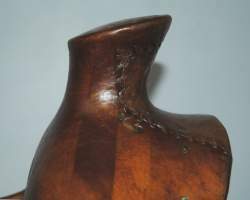 Height is traditionally measured at the front of the horn since the bottom of the back of the horn is impossible to find once everything is shaped. But just because you can’t measure it doesn’t mean the height at the back is unimportant. The overall appearance of horn height is a combination of pitch, cap size and measured height at the front. The taller the horn at the back, the taller it appears to be over all, so for the same height and cap size, the horn with less pitch will appear taller. Too short at the back and there isn’t enough room for your rope. Most of the wood post horns we make are 3” tall. Anything above 3 ½” tall looks really tall unless there is extra pitch on the horn. 2 ¾” is as short as is really practical to still be able to rope on. Please see our series of pages on Wood Post Horns for pictures of these variations. All horn caps are round unless you request otherwise. The guadalajara shaped horn cap is a common request, and we make these in all cap sizes. We can alter our standard shape if you desire. We have also made oval horn caps. Changing cap shape is an easy modification for us to make. We shape the neck of the horn so the dallies will go as far as practical to the bottom of the horn. We do need some curve between the bottom of the neck and the rest of the fork for strength purposes. We take more wood from the front of the horn than the back to let the cap extend more to the front of the horn. If you want a special shape to the horn, please contact us. Because it is wood, we can shape it however you want. We make exposed wood horns and exposed wood horn caps. These can stand up really well to hard use if the right wood and a good finish are used. Fully exposed Padauk wood horn. 3 1/4" high x 4 3/4" cap at 30 degrees. Exposed Jara wood 5" Guadalajara horn cap. Exposed Jara wood 5 1/2" horn cap after 2 years cowboy use. Like tree makers, every horn maker does things differently – or at least seems to name their horns differently even if they are the same horn! 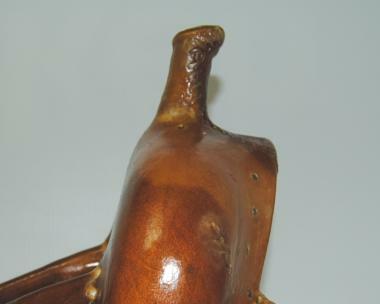 The horn name describes the combination of the shape of the neck, the pitch of the cap and in some cases, the size of the cap. Some horns come in different heights for the same name but some horn makers use different names for different heights of the same horn shape. We have three styles of horns on hand at all times, and two of the three styles come in different heights. 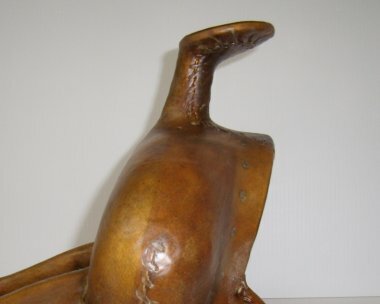 We use horns made of manganese bronze by Herb Bork of Bork Saddlery Hardware or Boise Foundry. Our most commonly used horn is called both a Hamley and a #6. 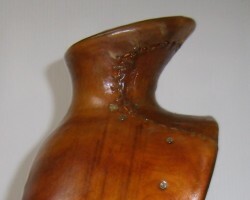 It has a moderate amount of pitch and relatively small neck. On a stood up fork, it has a lot of pitch to it. It comes labeled as four different heights: 2 ½”, 3”, 3 ½” and 4”. The next most common one is a #4 or Texas Dally. It has a thicker neck and a flat pitch. It comes labeled as 3 ½” and 4” heights. The third one we call the Old Timer. It is a horn Herb Bork made as a copy from a horn off an old slick fork. This one looks a lot like a #4 when rawhided, but goes really well on a slick fork. It only comes in a 3 ½” height. Because we add a wooden cap to the top of the metal horn, we can make any size horn cap you order. We have made them as small as 1 ½” by grinding away some of the metal cap first. With larger horn caps, you may want to consider increasing stock thickness to balance the look of the larger cap. The cap size chosen will affect the final measured height of the horn for a specific horn type. Since the neck length is set and there is some pitch to the horn, the larger caps will measure taller with the same horn when compared to the smaller caps. The horns measure closest to their designated height with about a 2 ¾” cap. For caps that are a lot larger or smaller than this, you need to decide if you want that measured height at the front (we will use the next size up or down to get as close to that height as possible) or if you want the neck length designated as x” tall, regardless of the final measured height. 2 1/2" cap on 3 1/2" tall Hamley horn. 3 1/2" cap on 3 1/2" tall Hamley horn. We position the horns so the neck is the same angle as the back of the fork, unless requested otherwise. We will lean the horn ahead if you want, and this is a common request for calf roping trees. Normal angle on 3" high x 2.5" cap Hamley horn, 4 1/4" stock thickness on a 3B fork. Leaned ahead 3" high X 1 5/8" cap #4 horn, 3 3/4" stock thickness on a stood up OY Calf Roper fork. We will use special horns if you tell us which ones you want. These may or may not cost extra depending on the price of the horn. 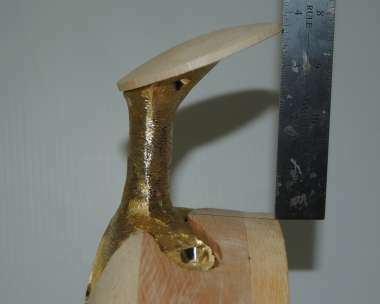 For big bellied Old Mex or pelican style of horns, you may want to consider having them made of wood if you want a cap 3 ¼” or larger. We can make the shape you want and it will be lighter than a metal horn.